On the tongue of the satisfied customers. The company was founded by brothers Gambhirdas Shah and Anantrai Shah way back in the 1950s as United Trading Corporation. The firm then dealt in just the import of food products. Post-independence, the government of India banned the import of food products. The company decided to produce the very products in India itself, to satisfy the customer’s demand thus, evolved the brand BLUE BIRD. Even in those early days of lack of resources & technology no compromises were made in the quality. Only the best available ingredients were used for the production and the tradition still follows. BLUE BIRD as a brand has achieved the quality compatible to the International standard. Ratio Use 25g Dry Yeast for 500g of flour or as directed in the recipe. 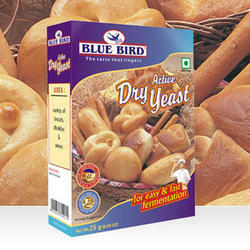 BLUE BIRD Dry Yeast is essential in the manufacture of breads, doughnuts, many a culinary delight. Take ½ cup lukewarm water (105º to 115 ºF). Add a pinch of granulated sugar and stir with a spoon until dissolved. Sprinkle the Active Dry Yeast over the top of the water. Incorporate the Active Dry Yeast into the water by stirring vigorously. The yeast should dissolve somewhat, turning from yeast granules to a semi-dissolved pasty texture. Cover the container with plastic wrap and set aside approximately ten minutes. When the yeast has become bubbly and / or foamy, it is active and ready for use in your bread recipe. Use 25g Dry Yeast for 500g of flour or as directed in the recipe. Prepare the yeast as per the directions on above. Combine all the ingredients except the olive oil in a bowl and knead into soft dough using enough water until it is smooth and elastic. Add the olive oil and knead again. Cover the dough with a wet muslin cloth and allow it to prove till it doubles in volume (approx. 15 to 20 minutes). Press the dough lightly to remove the air. Divide the dough into 3 equal parts. Roll each portion into a circle of 250 mm. (10”) diameter and 6 mm. (1/4”) thickness. Cook the pizza base in a regular oven at 260º C for about 10 min. 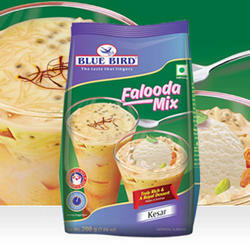 BLUE BIRD Falooda Mix is an all season classic royal dessert served cold, prepared by traditionally mixing rose syrup, Falooda sev and sweet basil (sabja/ takmaria) seeds (can be topped with a scoop of ice-cream). It is a favourite with all age groups. Falooda was originally introduced to India by the Muslim merchants from Persia and Blue Bird has maintained the same delicacy of a perfect taste to this nawabi dessert without you putting any extra effort. 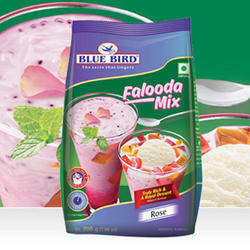 Blue Bird Falooda Mix is available in 4 delicious flavour – Rose, Kesar, Mango and Strawberry. 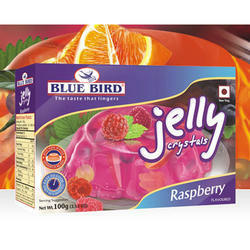 This unflavoured gelatine is for all creative dessert chefs who can now justify their culinary uniqueness in making desserts. Probably best known as a gelling agent. 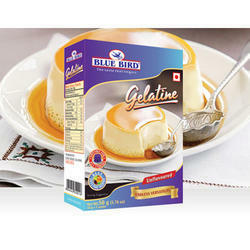 Blue Bird Gelatine is a magical ingredient for giving desired shape to any edible liquid. 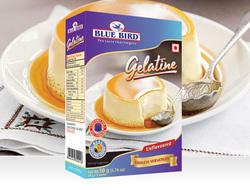 Blue Bird Gelatine can be used to make jelly, mousse, pudding, panna cotta, marshmallow, tiramisu, soufflé, etc. Pour milk into a small bowl, and stir in the gelatine powder. Set aside. In a saucepan, stir together the heavy cream and sugar, and set over medium heat. Bring to a full boil, watching carefully, as the cream will quickly rise to the top of the pan. Pour the gelatine and milk into the cream, stirring until completely dissolved. Cook for one minute, stirring constantly. Remove from heat, stir in the vanilla and pour into six individual ramekin dishes. Cool the ramekins uncovered at room temperature. When cool, cover with plastic wrap, and refrigerate for at least 4 hours, but preferably overnight before serving. It's an ideal sweet dish for any Indian Occasion at home. It's one of the easiest to make with the most delicious taste, simply hard to resist. 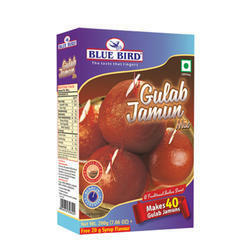 It comes with a free 20g syrup flavour which gives an amazing flavour to your Gulab Jamun. 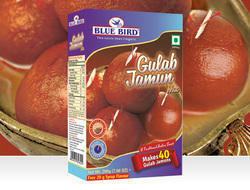 Add 100-120 ml water to Blue Bird Gulab Jamun Mix and make it into a soft dough by gentle mixing. After 5 minutes apply ghee or oil on the palms & then shape 40 round and smooth jamuns without cracks. Tip - Add water in parts (10 ml) while mixing. Deep fry in ghee or oil in low heat over a period of 5 minutes; until golden brown. Drain excess oil. Tip - Frying should not be done at very high temperature. Soak the fried jamuns in hot sugar syrup of moderate strength for 30 minutes. Prepare sugar syrup by dissolving 600g sugar and Syrup Flavour Mix in 600 ml water. Boil and simmer for 5 minutes. 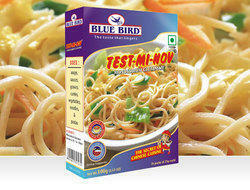 BLUE BIRD Test-Mi-Nov known as Ajino-moto is a flavouring agent which enhances the taste and brings out the natural flavour from within. It is obtained from vegetable sources & mainly used in Chinese cuisines. TEST-MI-NOV is an ideal flavouring agent containing Monosodium Glutamate produced from vegetable sources. TEST-MI-NOV dissolves easily in all foods and enhances the natural flavour of the food in which it is used. TEST-MI-NOV is processed to improve taste and texture of the food to impart juiciness and retain moisture. Soups, sauces, gravies, curries, vegetables, noodles & pastas. Place the pot over medium heat and stir in the heavy cream and butter. Season with Testi-Mi-Nov, salt and pepper. Heat, stirring until the butter is melted. Do not boil. 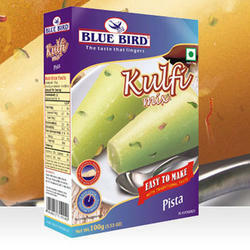 It's a magical ingredient which works wonder with batter of khaman, dhokla or Idli. With this ingredient let your imagination go wild with your culinary talents. It's an essential kitchen ingredient that perfect for all your baking needs. 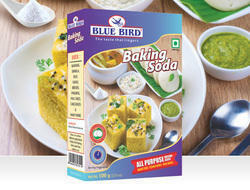 Blue Bird Baking Soda can be used in preparation of various dishes like Khaman, Dhokla, Idlis, Vadas, Breads, Pakoras, Pan Cakes, Cake Bases and many more. 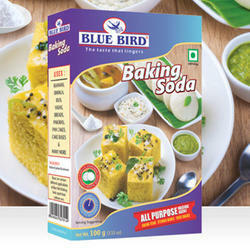 There are various different application of Blue Bird Baking Soda apart from culinary use. Take gram flour in a bowl. Add yogurt with approximately 1 cup of warm water and mix. Avoid lumps. Add salt and mix again. Leave it aside to ferment for 3-4 hours. When gram flour mixture has fermented, add turmeric powder and green chilli-ginger paste to it, mix well. Heat the steamer. Grease a thali. 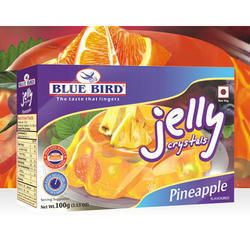 In a small bowl take Blue Bird Citric Acid, Blue Bird Baking Soda, 1 tsp of oil and mix. Add it to the batter and whisk briskly. Pour batter into the greased thali and place it in the steamer. Cover with lid and steam for 10 minutes. Allow it to cool, cut into squares and keep in a serving bowl/plate. Heat remaining oil in a small pan. Add mustard seeds and when the seeds begin to crackle, remove and pour over the dhoklas. Serve, garnished with freshly chopped coriander leaves and grated coconut. 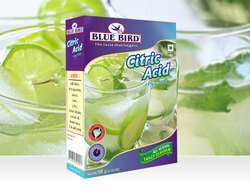 BLUE BIRD Citric Acid is an edible preservative for a variety of products from soft drinks to jams and jellies. It is added to beverages, squashes, concentrates and sauces. 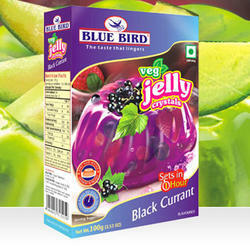 It is a substitute for lemons & lime to give a tangy flavour to your recipes. Dissolve Citric Acid, sugar and salt in ¼ cup water, add besan, 2 cups water, green chilli paste and soda bicarbonate (baking soda) and whisk thoroughly. Grease a thali and pour this batter. Place the thali in a steamer and steam for 10 min or until cooked. Temper with mustard and cumin seeds and pour the tempered oil over the dhokla. Baking is a field of perfection whether its ingredients or timing. 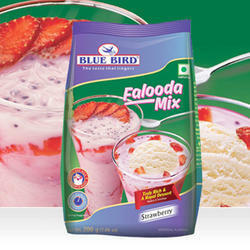 Blue Bird Cake Mix has got both. The ultra-soft spongy base will make you go crazy, craving for more. It’s simple and easy to prepare and is superbly delicious. Heat the oven to 180° C. Grease pan with oil or butter. Sprinkle lightly with flour. Add 220 ml water to the cake mix in a bowl and stir well at slow speed with an electric beater/hand beater for 2-3 minutes till the ingredients are properly mixed and a uniform smooth batter without lumps is formed. Cake is baked when a knife inserted in cake comes out clean. Remove cake from oven and cool in pan for 25-30 minutes. Remove from pan, cool completely and apply icing. 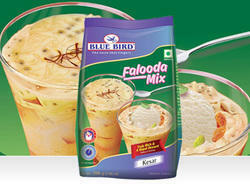 BLUE BIRD Mousse is an instant dessert that can be made in just 3 minutes of whipping & 15 minutes of setting time. 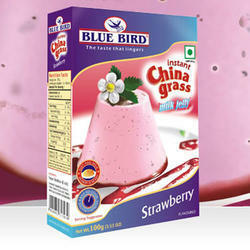 Kids love its taste, elders love it for its soft, smooth & creamier nature. 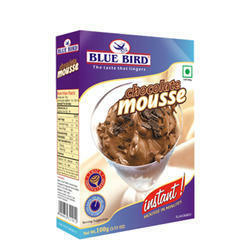 Dissolve BLUE BIRD Chocolate Mousse (entire content of the packet) in 200 ml (8º C) cold milk. Whip the mixture with an electric whipper for 3 minutes, at maximum speed. In case of a manual whipper whip it for 6 minutes. Refrigerate for about 15 minutes and now your delicious Chocolate Mousse is ready to serve. 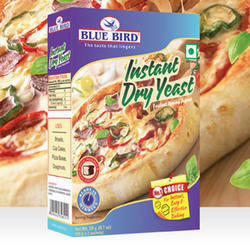 Blue Bird Instant Dry Yeast is one of the fastest fermenting agent, best suitable for all your everyday baking needs. Its unique formulation enhances the dough volume to its maximum limits without much waiting. A 10g sachet is sufficient for 500g to 1 Kg of flour. Either add directly to the flour or mix with the dough one minute after kneading has begun. Breads, Cup Cakes, Pizza Bases, Doughnuts. BLUE BIRD Jelly Crystals is an all time favourite with all age groups. It can be had by itself or accompanied with fresh cream or plain or flavoured custard, myriad combinations with cakes, salads, ice creams and sundaes. Dissolve the contents of the packet in 250ml. of boiling water. Add 250ml. of cold water and stir. Refrigerate at least 3-4 hours or until firm without disturbing. 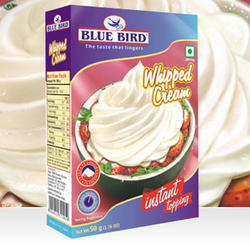 BLUE BIRD Whipped Cream is a smooth flowing cream that can be prepared in 3 minutes flat, by just adding chilled water. Ideal for decoration of cakes & pastries, topping for sweets & desserts and to thicken mocktails & milk shakes (instead of ice creams). 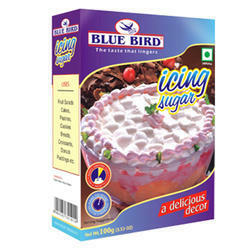 Dissolve BLUE BIRD Whipped Cream (entire content of the packet) in 90ml. (80°C) cold water. Whip the mixture with an electric whipper for 3 minutes at maximum speed. In case of a manual whipper whip it for 6 minutes. Refrigerate for about 15 minutes and now your whipped cream is ready to use as a topping. 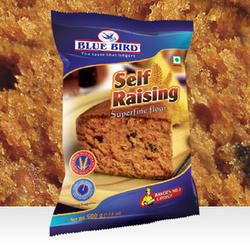 BLUE BIRD Self Raising Flour is made using the best quality wheat and the right percentage of baking powder. This perfect blend of flour eliminates the need of adding baking powder and is easier for producing delicious doughnuts, cakes and pastries. Everything tastes better when you make it with 'Blue Bird' Self Raising Superfine Flour. It gives the recipe a delicious, yummy taste. Self Raising Superfine Flour is great to use in dessert, cakes, pastries, cookies, breads, croissants, donuts, puddings etc. 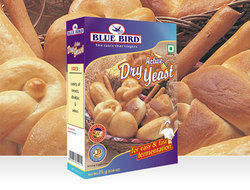 BLUE BIRD Baking Powder has been and is a standard ingredient for cookies, cakes and certain breads. It is an essential ingredient for the kitchen shelf. 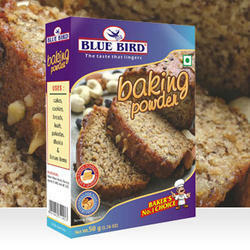 Blue Bird Baking powder is a daily useful ingredient for any kitchen shelves. Normally use about 10gms. 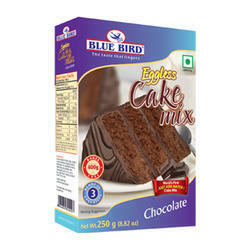 (1 tbsp) of BLUE BIRD Baking Powder for 450gms. (3 cups full) of flour. Mix BLUE BIRD Baking Powder and flour thoroughly in a dry state. Sieve the mixture two or three times. The finished dough should preferably be baked immediately or may be kept in a cool place and baked at leisure. BLUE BIRD Cocoa is 100% pure cocoa. It is an important ingredient in a variety of sweets and desserts. 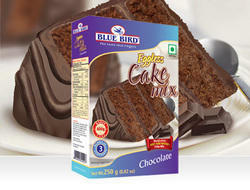 It enhances the flavour of chocolate based cakes, brownie and muffins. 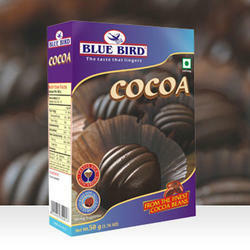 Blue Bird Cocoa Powder is used in a variety of chocolate dishes, milk shakes, chocolates, cookies, Indian sweets, toppings for ice creams, etc. 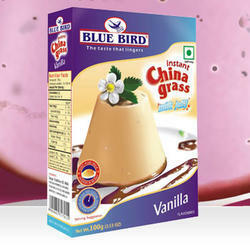 BLUE BIRD China Grass is one of the most enjoyed dessert of the young and the elderly. This milk based dessert has a high nutrient content and can be made in a variety of shapes which is a delight to the kids. It can also be used as fillings for cakes, sandwiched between mousses and truffle combinations. Add the contents of the packet to boiling milk. Stir vigorously till dissolved. While hot pour into a flat dish or small cups. Sets within 10 minutes with / without refrigerator. Take 400ml. of fresh milk. Dissolve the contents of the packet in the milk. Boil the mixture for 4 to 5 minutes stirring vigorously. Cool it to room temperature and pour the mixture into Kulfi moulds. Keep in the freezer to set. Within 2-3 hours it’s ready to serve. BLUE BIRD Veg. Jelly Crystals is the best vegetarian dessert. 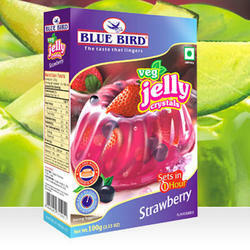 No compromise has been made on the taste, texture & flavour even without using gelatine. Mix both BLUE BIRD flavour Mix and Jelly mix into a bowl properly. Add the prepared mix to boiled water and stir vigorously until fully dissolved. Remove from heat and slowly pour into moulds. Mixture will thicken as it cools. Refrigerate at least 1 hour without stirring. To unmould loosen edges of the flan from mould with tip of a knife. Top with plate, invert plate & mould. Now remove the mould. 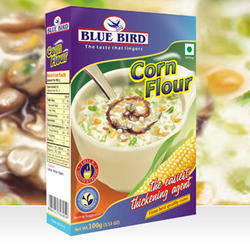 BLUE BIRD Corn Flour is the finest corn starch. It is used in the making of many varieties of bakery, Chinese dishes, sweets, sauces, custards, puddings and desserts. To make one cup (250 ml.) of Gravy or Soup, blend 1 heaped tbsp, (15 g) BLUE BIRD Corn Flour into a little cold water. Stir slowly to remove any lumps formed and make a uniform creamy blend. 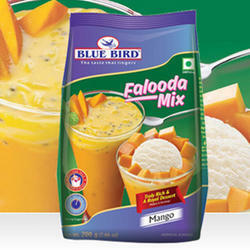 Now your smooth mixture is ready to use for any recipe. For thickening Soups, Gravies and Sauces. For Samosas, Pattice, Spring Rolls. For lighter Baked Dishes, being Superfine, it is ideal for rich Cakes and Pastries. For delicious Desserts, Puddings, etc. Beat the butter; add in icing sugar a little at a time. Add essence and edible colour & mix them uniformly. Use the mixture for applying on cake & for decoration. Fruit Salads, Cakes, Pastries, Cookies, Breads, Croissants, Donuts, Puddings etc. 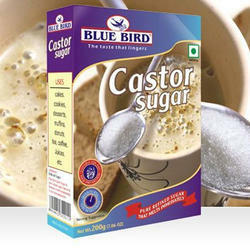 BLUE BIRD Castor Sugar is the bakers and housewives companion. Whether its with your cup of tea or hot chocolate this finely granulated sugar is too good and quick to melt. Useful in the making of sponge cakes, shortbreads, pastries and biscuits. Cakes, cookies, desserts, muffins, donuts, tea, coffee, juices, etc.